Bayfield seniors Hayden Farmer and David Hawkins will hope to run past Faith Christian and back home for the semifinals. 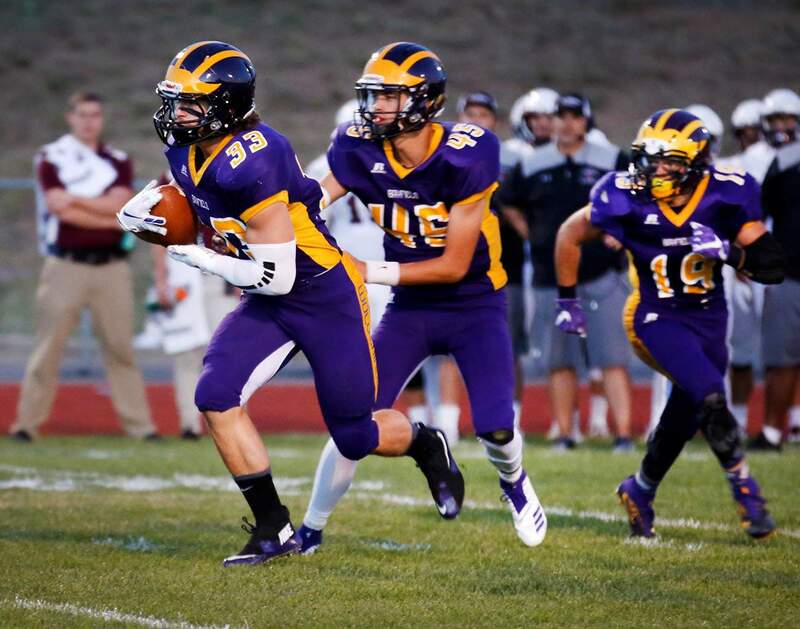 It takes more than one offensive weapon to beat the Bayfield High School defense. Faith Christian has multiple. The No. 1 Bayfield High School Wolverines will hit the road to face No. 9 Faith Christian at 1 p.m. Saturday in Arvada. 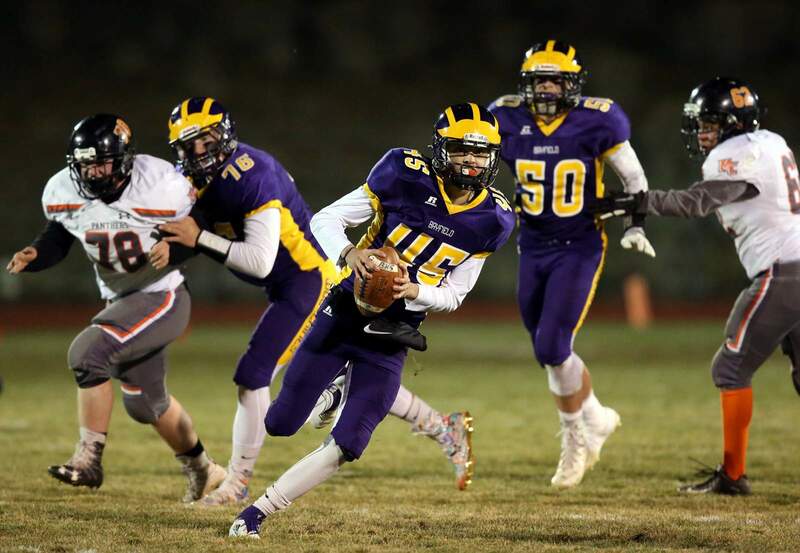 It’s a 314-mile bus ride for the defending state champions to meet the host Eagles in the Colorado High School Activities Association Class 2A State Football Playoffs quarterfinals. Faith Christian (8-2) is fresh off a 9-7 road win at No. 8 Kent Denver in the first round to avenge a 23-17 home loss back in September to Kent Denver. A year ago, the Eagles advanced to the quarterfinals before a 28-25 loss to Resurrection Christian, who Bayfield went on the road to beat in the semifinals. The Wolverines (8-1) avoided an upset attempt from No. 16 Montezuma-Cortez at home last week, as BHS erased a 14-0 deficit to win 19-14. 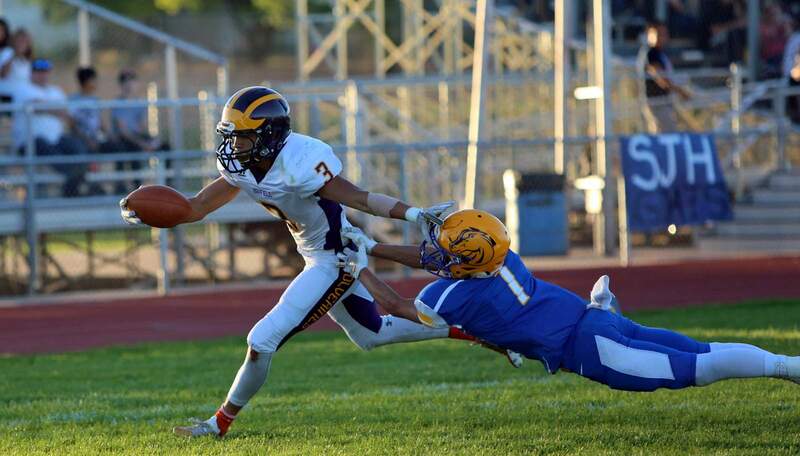 Bayfield and Faith Christian have long met in the playoffs in various sports, but the football teams haven’t met since the first round of the 2014 playoffs, a game the Wolverines lost 40-14 in Arvada. Bayfield hasn’t allowed that many points to an opponent in a game since. That’s largely thanks to the schematics of defensive coordinator Mike Wnorowski, who always seems to make the right adjustments and utilize Bayfield’s talent to the best of its ability. Heide is confident his defensive coach will do the same this week. Keyon Prior has more than 1,000 total yards this season and has done a bit of everything in all three phases of the game for the Bayfield Wolverines. Led by first-year head coach Vince Siravo, the Eagles boast a well-rounded run and pass game. Senior running back David Nagy leads the way with 1,042 yards rushing with 19 touchdowns on the ground. He isn’t a threat in the pass game, but the Eagles have other weapons for junior quarterback Isaiah Kroll, who has thrown for 875 yards, seven touchdowns and two interceptions this season while completing 53 percent of his pass attempts. Kroll’s top target is senior Jordan Abbott. The 5-foot-11 receiver has a team-high 33 receptions for 483 yards and four touchdowns. Brian Turner, a 6-foot-1 junior receiver, has another 143 yards and a touchdown on eight catches. Behind Nagy is junior running back Erick Granados, who has 494 yards rushing and three touchdowns. Abbott also has run for 379 yards and six scores, and Kroll also has shown an ability to run, especially in the red zone, with 242 yards and eight touchdowns. As a team, Faith Christian has run for an average of 224 yards and 3.8 rushing touchdowns per game. Bayfield has relied on the play of its seniors to win three consecutive close games with big stakes. Now, those seniors are eager for one more win to guarantee a home game in the semifinals in what would be their final game at Wolverine Country Stadium. David Hawkins has been an offensive and defensive force, with 1,049 rushing yards and eight touchdowns on the ground and a team-high 87 tackles, including three sacks. He also has an interception, two fumble recoveries, including one for a touchdown, and two blocked punts. Faith Christian’s defense proved it could stop the run last week, though, as it bottled up Kent Denver’s Seth Lindsey, especially during crucial moments of the game. The Wolverines will have to counter with senior Keyon Prior and junior Dylan Hilliker behind the power of Hawkins. Hilliker and Prior are both threats in the run and pass game and have combined for 1,567 yards of offense and 15 touchdowns this year. Bayfield’s Hayden Farmer has had a good week of practice and looks to be back in form going into this week’s playoff game at Faith Christian. BHS senior quarterback Hayden Farmer showed good accuracy in last week’s win against Montezuma-Cortez and has recovered well from an injury earlier this season. Heide said he has had an impressive week of practice and looks to be back in the form of last year’s state championship season when he completed 58.6 percent of his passes and threw for more than 2,000 yards and 35 touchdowns. This season, Farmer has been held to 986 yards and nine touchdowns, while he’s thrown 10 interceptions and completed only 40 percent of passes. “Hayden is throwing the ball the best he has since his injury and has looked really good this week,” Heide said. “We will loosen him up and try to be real balanced. While Faith Christian has been eager about a chance to play Bayfield in the playoffs, it will have to be wary of the potent BHS defense. While not on a historic pace like last year, the Wolverines still have 39 sacks as a team, led by 13 from senior Isaac Lorenzen and eight each from Rhett Hoover and Daniel Westbrook. John Foutz has also been a force late in the season with several big tackles. The Wolverines also have 19 interceptions, led by six from Alec Demko, along with nine fumble recoveries. When the Bayfield defense gives the Wolverines’ offense a chance, Bayfield must convert. The Wolverines have been held to only six points in the first half of the last three games and zero in the last two.